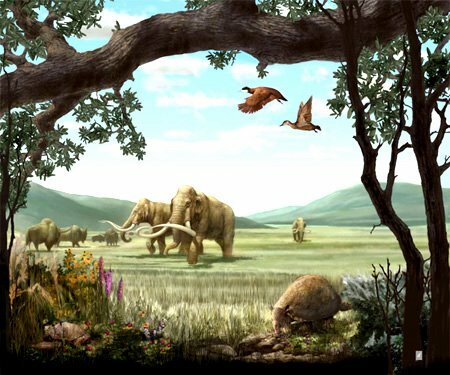 Sergey Zimov – “a hardy Russian biologist” – “is trying to recreate a landscape not seen on Earth for nearly 10,000 years, since the end of the last ice age – complete, if possible, with woolly mammoths. 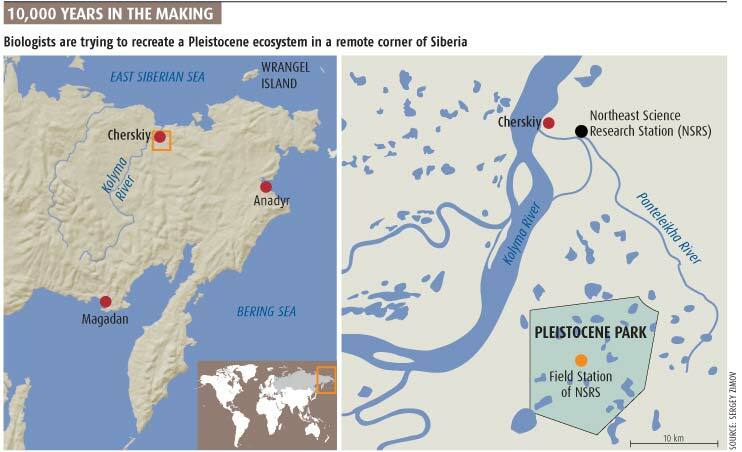 The project is called Pleistocene Park, but it’s not a tourist attraction,” New Scientist says. So what happened? Zimov blames the arrival of human beings (I’m imagining a century or two of intensely aromatic, Conan the Barbarian-style outdoor barbecues), and, to prove this, he’s organized the Pleistocene Park. It may even be re-populated with cloned mammoths; then the ecological experiment will begin. Upon further reflection, I’m thinking at least four things: 1) it seems a very odd coincidence that the exact same thing is being proposed right now for central North America; 2) why only the Pleistocene? let’s rebuild the Hadean era, or bring back some Devonian seas; 3) why does it have to be an ecosystem? why can’t we rebuild the architectural world of, say, the Holy Roman Empire? or pre-war Europe? cool roads and little chapels everywhere, tiny villages – the Minoan labyrinth! ; and 4) if a forward-thinking restaurant did this, they’d have the most amazing supply of ingredients in the world. [For other preserved landscapes, see BLDGBLOG’s Silicon Gardens]. 4a) Rainforest Cafe, the Pleistocene Diner prototype. Something tells me that’s actually quite likely. We’ll have to wait and see. Pizza Hut’s Ancient Elk-Lovers Pizza. Isn’t that Busch Gardens Williamsburg — the Old Country? The idea is very EPCOT Center/Las Vegas. Caesar’s Palace is halfway there, and you’ve got Paris across the street. These crazy projects will only work if they are situated in Nevada and have hip hop shootouts, Siberian tigers, and prizefights inside. Well we got the Siberian tigers, I guess.